Jimmie Foxx set a standard for offensive power and consistency that wouldn't be matched for 60 years. His hitting and team leadership earned him multiple MVP awards as well as two World Series championships. 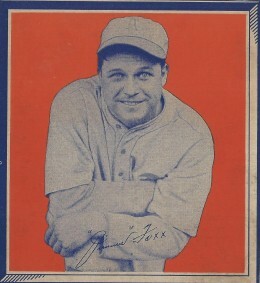 This top list collects the best Jimmie Foxx cardboard appearances and honors one of baseball's greatest legends. Shop for Professionally Graded Jimmie Foxx Cards on eBay. Foxx started his career as a catcher with the Philadelphia A's, but because Hall of Fame catcher Mickey Cochrane was standing in his way, he was moved to first base. In his ten seasons with the A's, Foxx won back-to-back MVP awards (1932 and 1933) and helped the team win two World Series titles. 1933 would prove to be his greatest statistical season, claiming the Triple Crown and hitting 48 home runs, 163 RBIs, and batting .356. 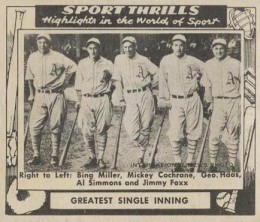 Foxx, given one of the best nicknames ever — Double X — began two impressive streaks while with the A's. He smacked 100+ runs for 13 consecutive seasons and hit 30 or more home runs in 12 straight seasons. That record would later be broken by the all-time home run king, Barry Bonds. Before retiring, Foxx would spend time with the Boston Red Sox, Chicago Cubs, and Philadelphia Phillies, and ended his career with 534 home runs, which put him second all-time. While his hitting was remarkable, it would be in the shadow of Babe Ruth as he was the second player to reach 500 home runs and Foxx would frequently be referred to as the "right-handed Babe Ruth." Collectors with more flexibility in their card budgets can try to track down some especially rare Foxx appearances, including the 1934-1936 Batter Up set and its multi-color variations, or the red and yellow 1933 Tattoo Orbit set. 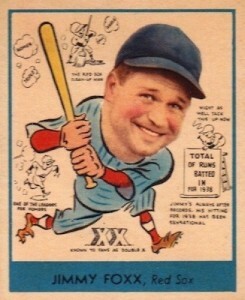 Fans looking for a card dedicated to Jimmie Foxx's time with the Chicago Cubs can look to the 1961 Fleer Baseball Greats set that includes Foxx with a Cubs cap. Another appealing choice, 1994 Ted Williams Card Company has a great Foxx card that honors his place in the 500 home run club. Among modern options, one of the most limited inserts in 2008 Topps Allen and Ginter is the Baseball Icons set, which could be pulled at a rate of 1:48 packs and includes a Foxx mini card. Fans interested in a Foxx collectibles outside of trading cards can try to track down an issue of Time Magazine that featured him on the cover in 1929. Because of the appearances in the most popular sets from the 1930s and 40s, the key Jimmie Foxx vintage cards are incredibly sought-after and valuable. In making this top list, card value is balanced with graphic design and the ability for collectors to locate the cards. 1950 Callahan was produced by the Baseball Hall of Fame and featured sketches by artist Mario DeMarco of all the Hall of Fame members up to that point. For several years after the sets release, new cards were added for the recent inductees to the Hall. 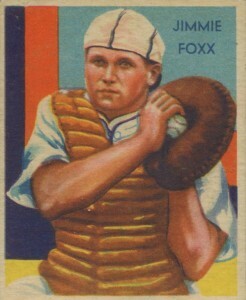 When Foxx was elected in 1951, his card was added to the set. Jimmie Foxx and four other Philadelphia A's greats share card #1 of the 1948 Swell Sport Thrills set that honors some of the greatest moments in baseball history. As the bottom of the card notes with the tagline "greatest single inning, the 1929 World Series saw the A's score ten runs in one inning against the Cubs to overcome an 8-0 deficit. These trading cards from the 1935 Wheaties set were found on the back of cereal boxes and, in total, there are 27 cards to collect. This includes two that were made for a "Jack Armstrong" who was supposed to represent an everyman. Hand-cut from the boxes, condition can vary greatly. 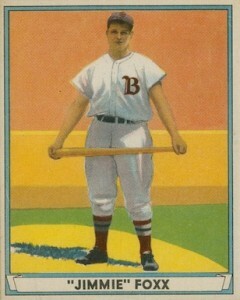 Foxx spent parts of seven seasons with the Red Sox and his 1941 Play Ball card is probably his best known from that era (with the possible exception of card #2 on the list). 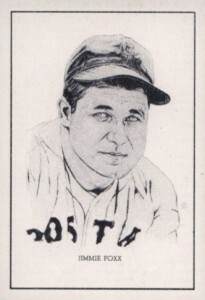 Foxx hit 50 home runs in 1938 and that would remain the Red Sox team record until David Ortiz finally surpassed it in 2006. 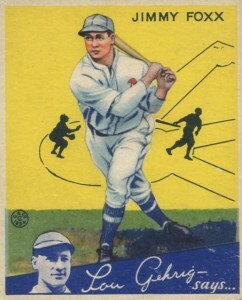 After the historic 1933 Goudey set, the follow-up set was less than half the size and many of the cards featured identical images with a few small adjustments. Foxx, being the best hitter in baseball and winning the Triple Crown in 1933, was given the honor of being placed at the #1 spot on the checklist. 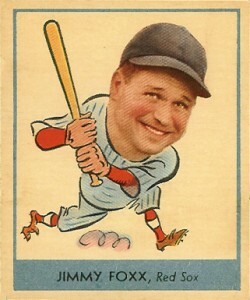 With the exception of his Diamond Stars cards, nearly all of Jimmie Foxx's cards from his playing days use the spelling "Jimmy" instead of "Jimmie" as is more commonly used today. Throughout his career, it seems that Foxx was alright with the usage of both spellings. His Hall of Fame plaque showcases "Jimmy" but the bat and ball he gave to the Hall are signed "Jimmie." 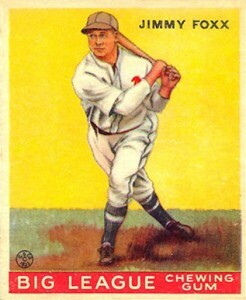 Foxx was the reigning MVP when his 1933 DeLong card was issued and he was just a few batting points short of winning what would have been his second career Triple Crown. This made his appearance in one of the most limited and popular sets also one of the most valuable as well. Jimmie Foxx has been featured in many modern sets produced by both Topps and Panini, including 2015 Topps Museum Collection and 2014 Panini Hall of Fame. In 2015 Panini National Treasures, several Foxx bat relics were offered in the checklist. Among these is a combo relic featuring his Philadelphia A's teammate for two seasons, Ty Cobb. 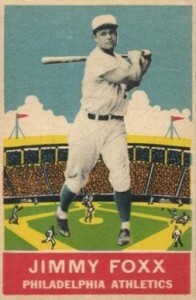 The 1938 Goudey design was certainly one of the most unique ever conceived and earned the nickname "Heads-Up" because of the over-sized photograph heads on the illustrated bodies. Foxx has two cards in the set with the second one having tiny details about him added to the background. Twenty-three other players have these double cards in the set. Much like the cards at #2 on the list, Foxx also has two cards in 1933 Goudey. However, the two options that year had identical fronts. Both versions are equally popular today and either version can can top $500 for mid-level graded versions.